Hannah graduated from the University of Brighton in 2007, and now works commercially as an illustrator and designer. Previous clients include the V&A, Pizza Express, Paul Smith, GQ Italy, Uniqlo Japan, Computer Arts projects and Routledge publishing. 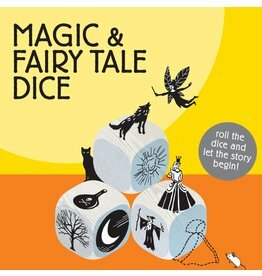 Revive the art of storytelling using these beautifully illustrated wooden dice to create the most imaginative stories.